‘Gilmore Girls’ Netflix Revival: Last Four Words Revealed for Rory and Lorelai! Needless to say, the beloved pop-culture touchstone&apos;s Netflix revival — which premiered Friday, November 25 — really threw Us for a loop with its final conversation. And be sure to click here for our full recap of the four episodes&apos; twists and surprises. What&apos;s the Hype About These Four Words? Before we tell you how Gilmore Girls: A Year in the Life signs off, we have to remind you that back in the day, creator Amy Sherman-Palladino teased that the whole series would conclude with four words she&apos;d picked for her much-adored characters to utter. Unfortunately, she and The WB brass parted ways before the seventh and final season, which made for a lackluster end to a spectacular show. Needless to say, it didn’t end with the four words she had envisioned. Sherman-Palladino kept the secret under lock and key for years and years, never divulging the back-and-forth she&apos;d planned for her characters. 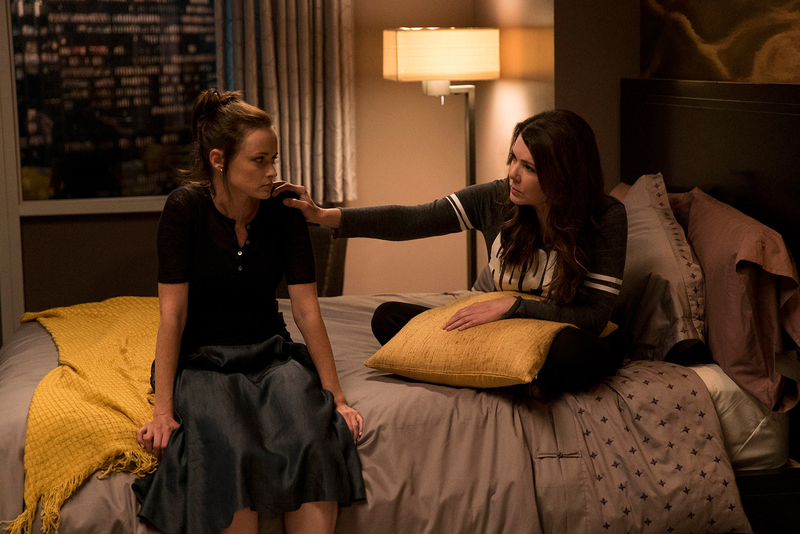 Even stars Lauren Graham (Lorelai) and Alexis Bledel (Rory) revealed that they didn&apos;t know the words until they signed on for the revival, and the mysterious exchange was never written down on a script to prevent getting leaked! Shocked?! Us, too! So the big question: Who the heck is the dad? (Save us, Maury.) Rory introduced boyfriend Paul (Jack Carpenter) in the revival&apos;s first episode — but then viewers saw her getting cozy with Logan (Matt Czuchry). Or maybe the father is (shudder to think) the guy in the costume? The suspense! Does this mean the series is coming back? Will we be getting a new Gilmore Girl (or Boy)? Hopefully, we won’t have to wait another decade to meet the tyke! Tell Us: Did you correctly predict the words? Gilmore Girls: A Year in the Life is streaming now on Netflix.